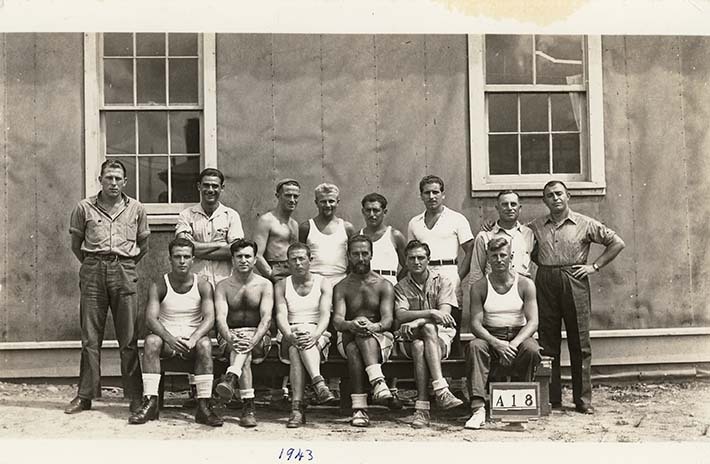 Double row of 14 internees in light spring/summer wear posing for photograph; 6 are seated in front row. An identification card reading "A18" is positioned on the ground in front of the internee seated at the far right. This image was likely taken at the same time as DICEA2011.0001.0005. The third individual standing from the far left is Nello Trasciatti; it appears he was the last Italian Canadian released from camp on July 6, 1945. Photograph is dated in blue ink to 1943. As a result, this picture would have been taken in Fredericton Internment Camp, where the remaining Italian Canadian internees were transferred in July 1942. The identification card used suggests it was a formal picture taken by a government official.